When I planned to announce the winner of my Canvas quilt pattern giveaway on Tuesday the 12th, I forgot that I would be camping then. So, here I am to finally announce that Lorna is the winner of the pattern, courtesy of Leanne at She Can Quilt, and her pattern has already been emailed to her. Congratulations, Lorna! We are just back from four nights camping at Blow Me Down Provincial Park, which is one of my favourite places to visit. 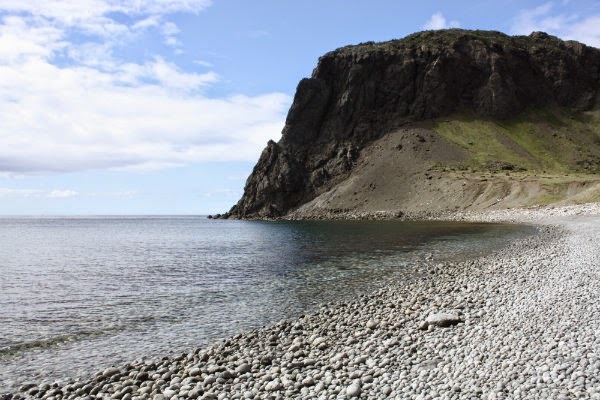 While on the beach at Bottle Cove, we were surprised by a beach-goer of a different sort. 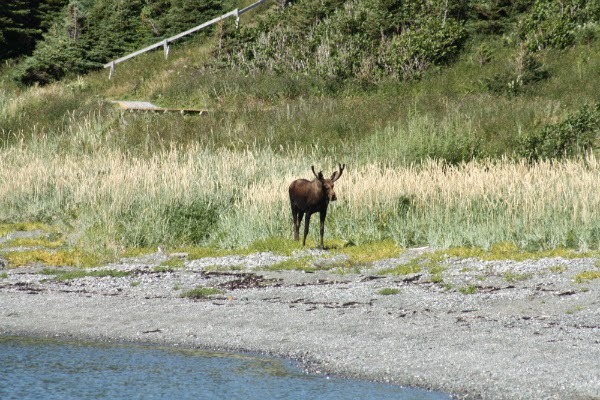 This young bull moose wandered along at the edge of the grass, seeming rather unconcerned about all the humans watching him from the water's edge and from farther up the beach. I think this is the closest I've been to a moose. It was fun to watch him, though I have to admit I was a little nervous as he walked past me and Nathan, considering he was only about 30 feet away. I love looking for sea glass, interesting rocks or pretty shells and Bottle Cove is great for all three. I could easily spend an entire day on this beach, but even after two hours I went back to the truck with my pockets full. All three boys are excellent hikers, so we tackled two new hikes this trip. 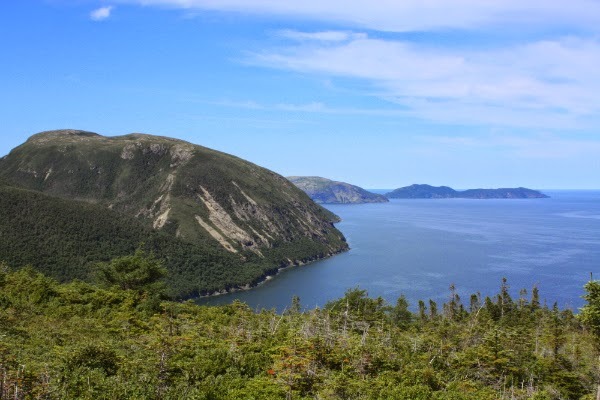 One took us to Cedar Cove beach and the other took us 230 feet up to the top of Lark Harbour Head. 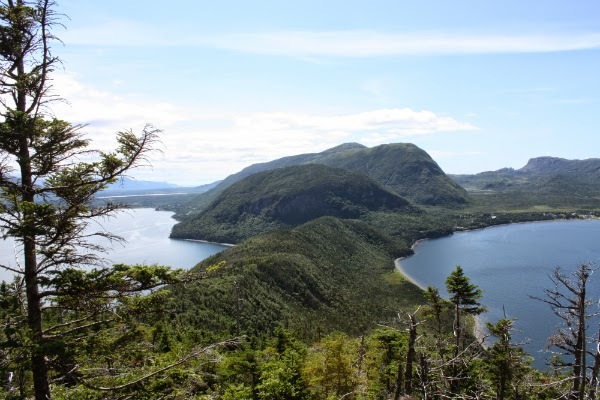 There's another hike we want to do, which takes you over 600 feet up a different mountain, but we'll have to wait until Nathan is a year or two older. I think that would be a little much for his legs right now! 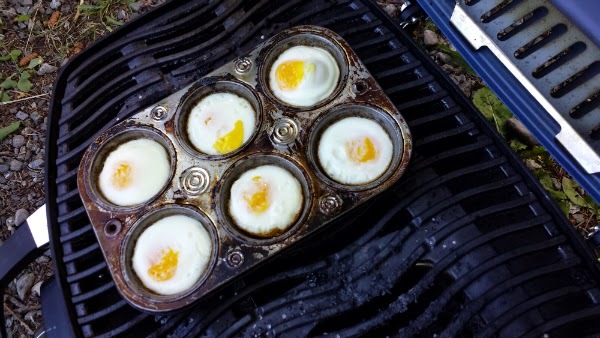 Paul came across this idea for baking eggs in the portable barbecue, so we gave it a try one morning for breakfast. It worked perfectly! We're hoping to get one more camping trip in before school starts. It's amazing how quickly this summer has flown by. Looks amazing! Looking for seaglass is one of my favorite things, ever. One time I went to Monterey, CA with my husband for a conference and found a sweet little beach behind the warf that had some lovely pieces of seaglass. 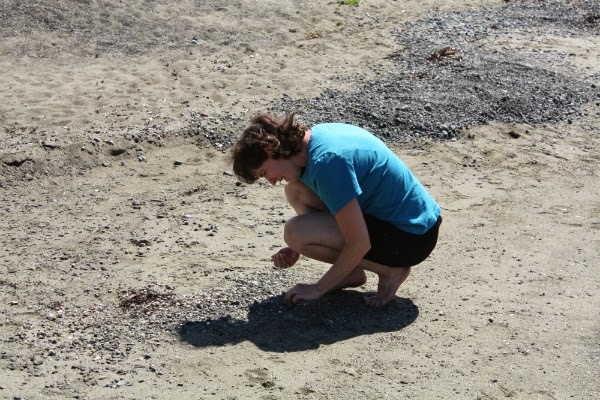 I love the beach and looking for treasures! 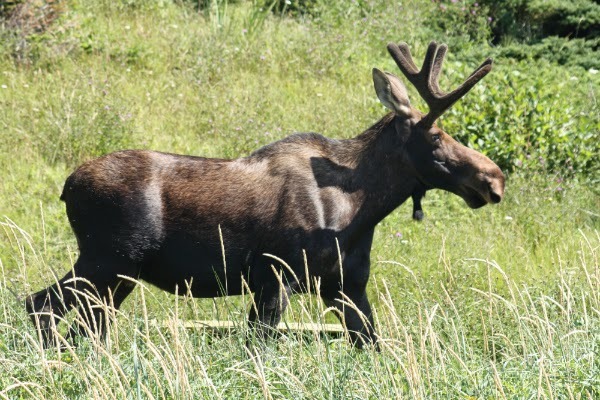 I've never seen a moose before, but I worked at a wild animal park for many years, and the bull elk was one of my favorite animals...so I just kind of assume moose are as cool as he was. We've been out camping every month since April, it's been really great, though I wish we were closer to the beach! Love the photos from your trip! I would have been nervous about the Moose, too. I think looking for sea glass is a really fun, calming way to spend an afternoon. The hiking sounds super appealing to me, too. 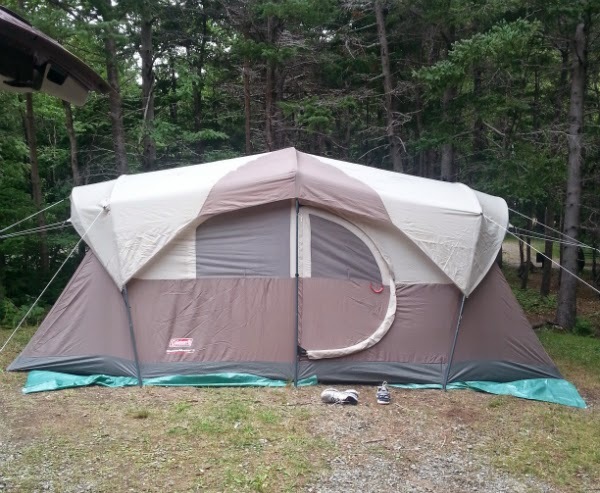 Yup, that seals it, I need to ask my husband to help finalize our camping plans for my birthday! Oh Leanne, this looks like the perfect spot for some wonderful family time. Gorgeous views - looks like a lovely trip! I'd be very nervous about a Moose being that close!